UL Certified Fire Alarm Installations and Testing -In House! 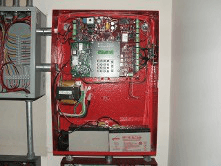 At Champion Fire Systems, Inc. we specialize in all aspects of fire alarm installations, new constructions, tenant improvements, and expansions. Call or email us for your annual, semi-annual, quarterly, or regulation 4 testing and repairs. Know your central station alarms are in working order with the help of our fire protection company. Services include installation, take over, monthly monitoring, and annual testing of fire alarm and sprinkler monitoring systems. Our fire protection specialist can assist you with any of your needs. We will work with you to design and build the system that will keep you safe. Give us a call for a free estimate and consultation. We’ll answer your questions. Fill out the form below and a fire protection expert will get in touch with you to begin your free estimate.